I am using Ubuntu 11.10 on a netbook with 1 GB RAM and a single-core 1.66 GHz Intel Atom processor. If I have too many things running at a time, the system becomes quite slow (disk I/O seems to be the bottleneck), so I am careful to avoid this. Naturally, I want to be in control of when resource-hungry things run. I do all my package management from the terminal. I use Byobu, and have set it to show the number of packages to be upgraded in the bottom row. Every now and then Update Manager pops up to inform me about updates. This seems to be an a very resource-hungry application - it causes disk thrashing, and the window starts out as being unresponsive (Compiz makes it grey), and takes a long time to start accepting mouse input. This causes a disruption in whatever I'm doing, and the Update Manager doesn't even go away quickly after I click the cross button in the title bar. The system should automatically check for updates as it does now. This is fine. The Update Manager window should never open unless I manually open it. I can see that there are packages to upgrade at the bottom of my terminal window, and I don't want the system to spring bloated GUI windows on me when I'm not expecting it. You can change this behaviour with dconf Editor. Install the package dconf-tools. Start dconf Editor from Dash, navigate to com -> ubuntu -> update-notifier and untick auto-launch. Not the answer you're looking for? Browse other questions tagged update-manager software-sources or ask your own question. Is it possible to have a small indicator showing that updates are available (red for security updates) instead of having the update manager pop up? Is there a schedule for the system updates that come through update manager in 12.04? Can I trust the updates offered in the Update Manager? Update Manager got stuck (but not frozen) while installing downloaded updates. What should I do? 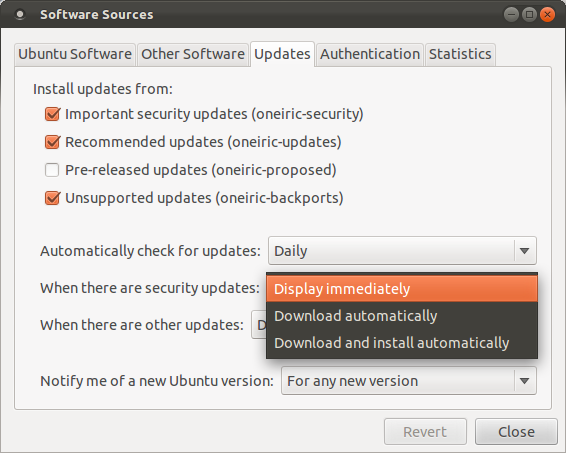 Should I use caution while doing updates via Ubuntu Update manager or not?